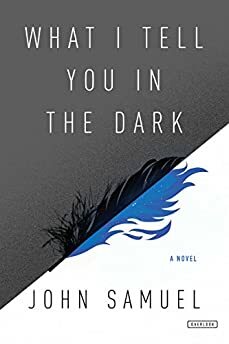 Largehearted Boy: Book Notes - John Samuel "What I Tell You In the Dark"
Book Notes - John Samuel "What I Tell You In the Dark"
John Samuel's novel What I Tell You In the Dark is a debut both hilarious and unsettling. "Dangerous, irreverent―blasphemous, even, in its confrontation of unpalatable truths―this book skillfully articulates the tension and dialogue between the sacred and the profane...Part fantasy, part gripping depiction of delusional madness, this is a very strong and assured new piece of fiction." This quiet, rough-cut little gem is a longstanding favourite of mine and is probably my top choice for this novel. I often found it whispering away in the back of my mind as I wrote. It's partly the resonance of the song's weary plea but, mostly, it's about the way those words are delivered. There's this blissed-out fatigue to Jason Pierce's voice that makes you feel like he's talking to you from across a great distance. The sense you get is that he's not quite ready to give up, and yet he's only just managing to stay this side of flaming out. It's a precarious, otherworldly state, and while I know that in reality this was the result of heroic levels of heroin consumption, for me it has become something else. Perhaps it's the muffled audio or the Englishness of the voice but in my mind this exists as Will's song, a perfect lament to the loneliness and rapture of his decline. This offering from the laureate of London's dubstep movement captures the grimy and chaotic street-level view of the city that is the backdrop for much of my novel. At one point, my narrator refers to London as ‘a light sleeper', and Burial's jarring, restless journey through the urban soundscape is the perfect complement to that idea. Will is about as unreliable as a narrator can get. He tells us that he's an angel, that he was once God's go-to guy for all the important jobs, and he assures that every word he speaks is the absolute, definitive truth. Everyone else in the book, meanwhile, seems to take a very different view. It is apparent through the reactions of his family, his friends, his colleagues and those who are unfortunate enough to cross paths with him when he's ‘at large in the world' (as he puts it) that he is, in fact, dangerously unhinged. This fundamental conflict creates a sickening wave of paranoia that sweeps through the book and affords Will little or no peace. And it is this that makes Polar's hectic, vicious, almost unlistenable "Mind of a Killer" such a good fit for this list. It's about as accurate an evocation of paranoid delusion as I think I ever want to hear. When I think about the difficulty of trying to make it as a writer while holding down a day job, raising a family and all that other stuff, I think about this track from JJ Grey. On a Monday morning when I'm shuffling into my stupid office building, or later, when I'm sitting dog-tired at the end of the day, wondering where I'm going to find the energy to write, I stick on this wonderful, soulful anthem to hope and feel just that little bit better. How many days can you hold out? it begins. Good question. When someone is in the grip of the kind of mania that propels my narrator, there are (very occasionally) weird moments of calm when, just for a second, the delusion loosens its grip. It's that letting your eyes go out of focus feeling, that down-shifting into neutral before it all kicks in again. That's what Jon Hopkins landed on with this spare, calm interlude on his spectacularly good 2013 album Immunity. There's a moment in my novel when Will, ravaged by insomnia and right on the point of terminal decline, finds himself mesmerised by a droplet of water that is slowly growing, trembling, about to fall – this is the music for that. Open your eyes/Put it in drive/Get on the road and just go – I've no reason to think that Hayden was talking about the process of writing or making music or any kind of creative endeavour when he wrote these opening lines to this amazing song but, if he was, he's even more of a genius than people realise. This short track sets to music a recording of the artist's father reading various passages of Farsi poetry and Iranian proverbs that he has noted down over the years. One reason for including it here is that I adapted some of its lines for a key scene towards the end of my novel. Another reason is that the story I wrote is, at heart, a story about fathers and sons, and this piece of music is so genuine and so perfectly simple in its arrangement that it effortlessly conveys the depth and power of that bond. This is an unusual outing for Mingus, who was not known as a pianist, and as the song's title suggests, it offers a rare glimpse of the man, not the performer. It is a tender moment of introspection and I include it here because I can't think of any other piece of music that offers such striking proof that behind all art there is the raw ingredient of the self. I'm not saying that I've burned quite as brightly as my crazed, unstoppable narrator, but I've done my share, and I guess my point is that without me, there'd be no him. At many stages in the novel, Will finds himself in awe of the natural world. Clearly, this is a feeling that Max Richter is also familiar with: this gorgeously elegiac piece never fails to work its magic on me. It's the perfect primer for a certain kind of writing. There is a passage in the novel that describes Will's reaction to hearing this song blaring out of a passing car: he's so enraptured by its message that he does this impromptu little dance on the pavement, much to the delight of some kids who start filming him on their phones and shouting words of ‘encouragement' (which eventually bring him to his senses and send him scuttling off on his way). Me? I became aware of this song as a result of one of my kids incessantly playing it during the period that I was writing this book. I think it's fair to say that it entered my consciousness with the same kind of unwelcome stealth that waterborne parasites swim up people's urethras in the Amazon. David Shields said of this kind of thing: ‘There is now a slogan, a melody, a raw building block of art living in his brain that he doesn't own and can't use.' Yes, true – except that, in this case, I did use it.